No pond is complete without a diverse ecosystem of aquatic plants. That being said, picking out the right pond plants can be surprisingly tough – there are floating plants, submerged plants, bog plants, emergent plants…where the heck do you even start? 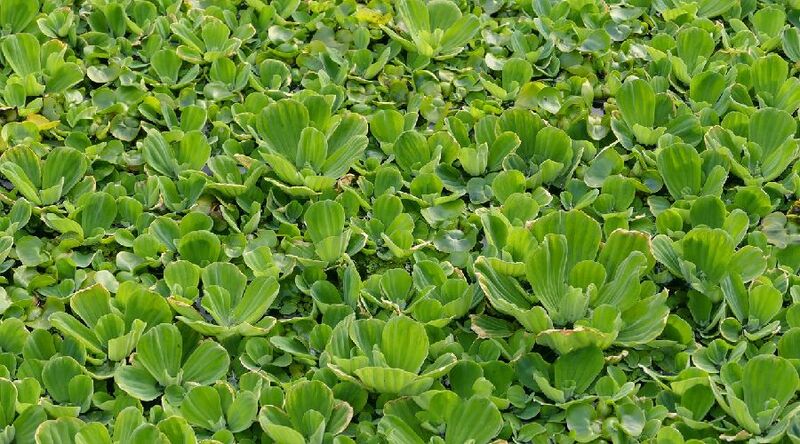 One of the most popular floating pond plants (and pond plants in general) is Pistia stratiotes, better known as Water Lettuce. This free floater is appreciated by pond owners for its decorative, lettuce-like growth pattern and easy care. Its long roots provide refuge for young fish and frogs and aid in filtering harmful nitrates from the water. It does grow very quickly in most environments, so be ready to regularly remove large amounts! If you’re in USDA zones 10 and up you’ll be able to grow water lettuce in your pond year-round. Any lower than that and it’s still a good option for your pond, but you might have to take a few rosettes inside when wintertime rolls around to save them from the cold and restart them the next year. Looking for a colorful floating addition to your pond? Water hyacinth may be the perfect choice for you. 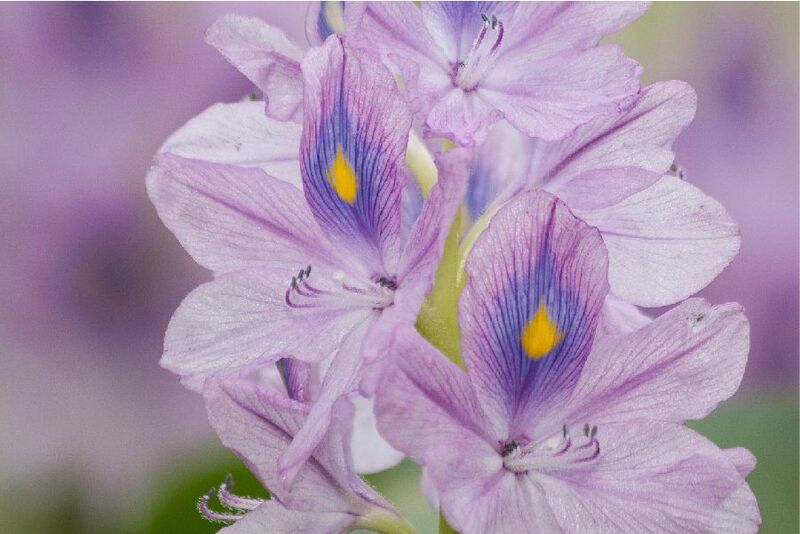 It lends its name from its lovely pastel purple flowers, which somewhat resemble those of terrestrial hyacinths and bloom all through summer in high temperatures. With Water Hyacinth, you won’t just have a colorful pond – you can also keep a few water hyacinths indoors in vases to brighten up your home! Like water lettuce, water hyacinth is easy to grow. In fact, it multiplies so quickly that it can be considered invasive. Be prepared to thin out your population regularly to avoid the rosettes from choking out other plants. Also, make sure to never let this plant get close to native waterways. You can grow water hyacinth year-round in USDA zones 8 and up – any lower and you’ll still be able to enjoy it during summer. Once winter starts you can leave the plants in your pond to die off and buy new ones next spring, or you can take a few rosettes inside. Another amazingly fast grower is the Salvinia natans. This spongy-leaved floater grows so densely it’ll look like there’s a green mat on your pond that you might be able to walk on! It offers great hiding places for aquatic life and can help keep your pond a little cooler during summer. Some pond owners also like to grow it separately as a snack for their goldfish or koi. You can grow Salvinia natans in your pond year-round if you’re in USDA zones 10 and up. Like the other floaters discussed here, you can simply let it die off after summer if you’re in colder areas. Alternatively, you can take a few rosettes inside to restart your ‘colony’ once it warms up. An interesting note here is that Salvinia natans is also a popular choice for tropical fish tanks. If you’ve got an indoor aquarium, you can maintain this plant year-round and use the colony to supply your pond after winter. The extremely popular hornwort has long been a favorite among pond owners due to its oxygenating properties and hardiness. Anyone can grow this plant – even first time aquarium/pond owners. All you have to do is toss a few strands into your pond and the plant will take care of the rest. A pot is not needed, as hornwort floats freely. Aquatic life such as damselfly nymphs, tadpoles and fish fry will love to use it as refuge. Do you live in a colder climate that gets frost during wintertime? No need to worry. Hornwort is quite tolerant of extreme water conditions and can actually return after dying off (almost) completely during the cold months. Another popular free-floating oxygenating pond plant is US native Elodea canadensis (or waterweed). As its common name suggests, this stem plant is a fast grower that, like some other pond plants, requires some caution. Without proper management this species can eventually overtake your pond. Regular removal of excess stems can help keep things under control, though. 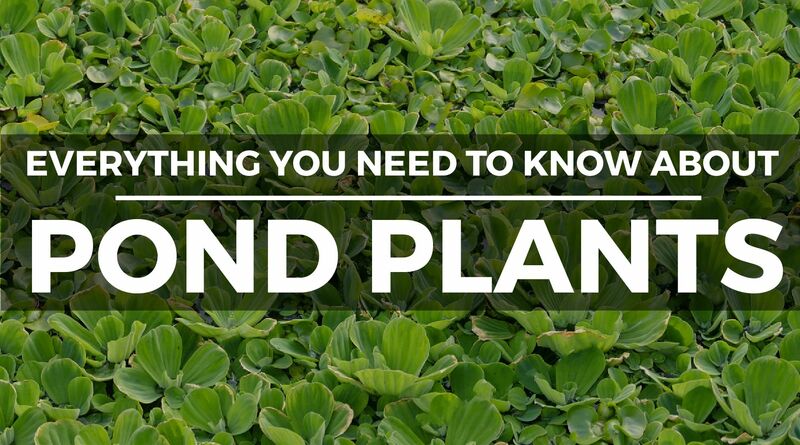 If you’re interested in growing this pond plant keep in mind that, like the other submerged plants (and some floaters) on this list, it is seen as a tasty snack by some fish species. Carp varieties like koi and goldfish will love to consume waterweed. This can be a blessing or a curse depending on your goals. If you’re looking to enrich their diet, you can grow this plant in a separate tub and use it as a supplemental food source. If you want to grow it in your actual pond, though, you might have trouble maintaining it in the long run with hungry fish around. If you have any experience with planted aquariums, you might be familiar with the genus Vallisneria. This seagrass-like aquatic plant is popular in freshwater fish tanks as it doesn’t require much care. Unlike waterweed and hornwort, it’s not free-floating. Instead, you can plant a few strand on the bottom of your pond (or in a pot) and let it grow. It multiplies by runners and should quickly form decorative ground cover. One reason eelgrass is such a good pond option is because there are several distinct species that vary in size. If your pond is deep and/or you want tall strands, consider Vallisneria americana. If the plant is going into a smaller container or you prefer shorter strands, try Vallisneria spiralis instead. It doesn’t grow nearly as large as americana, which also means less risk of it overtaking your pond entirely. 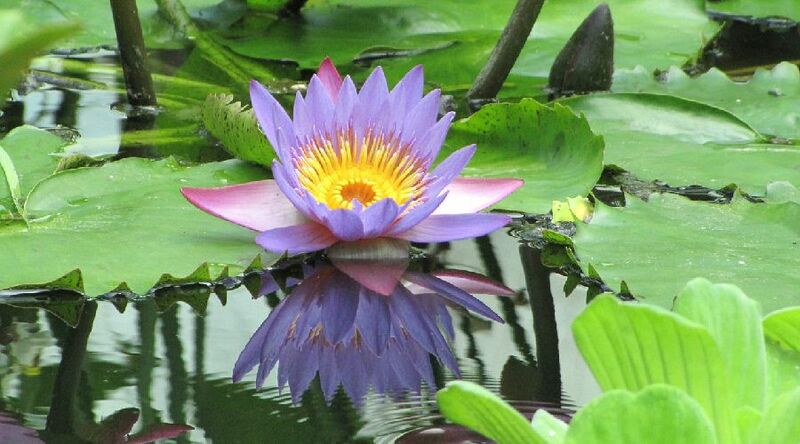 Every pond owner will probably grow water lilies at some point or another. Not only does this plant provide great cover and shade, but it also flowers gorgeously and vigorously during summertime. Whether you like pink, white or yellow – there’s a water lily for everyone. If you’d like to grow water lilies in your pond, you’ll need a pot to plant them in. Simply place the tubers in the soil and let the plant do its thing. Once it has established it will start to produce new leaves that you can let grow freely (or remove if things start to get a little too crowded). Most tropical lilies require warm water and should be taken inside if things get cool during winter (but if you live in a colder zone and don’t want to go through this hassle, there are still plenty of options). For the most part, though, lily species are very hardy and usually will regrow after winter die-offs. Want some flowers to brighten up your pond during the summer months? 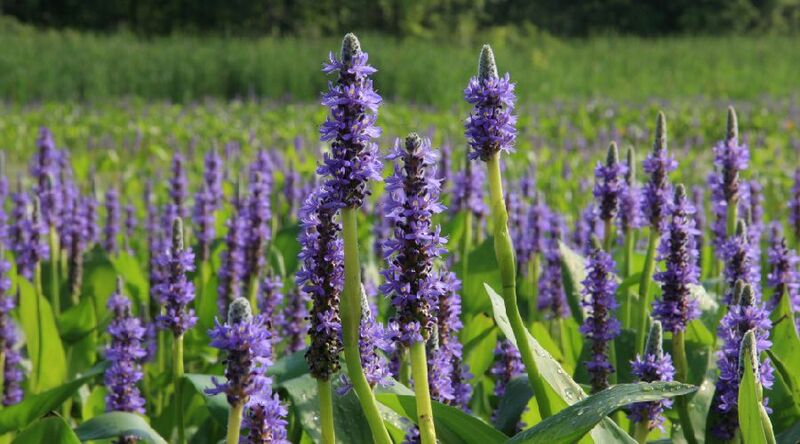 You’ll love the purple-blooming pickerelweed, which can be grown in pots in the shallower parts of your pond with the roots submerged and the leaves floating on the surface. Pickerelweed is easy to grow and doesn’t require much specific care, which makes it the perfect choice if you’re just starting out in the world of planted ponds. It’s also quite hardy and, unlike many of the other plants on this list, can be grown in USDA zones 3 and up. Its floating leaves offer shade and cover while its flowers attract bees and other non-aquatic life to turn your pond into a full-on thriving ecosystem. If you like the lush jungle look for your pond, arrowhead from the genus Sagittaria are an ideal choice. 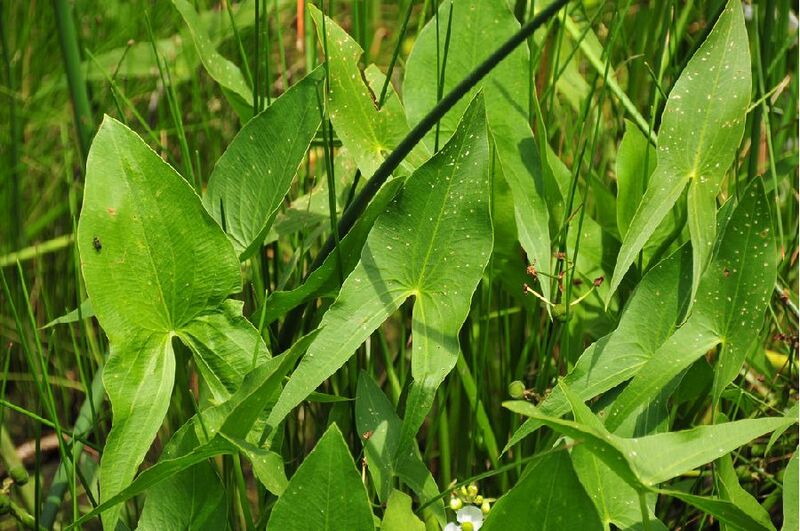 This shallow-water plant lends its name from its bright green leaves, which are shaped like arrows and grow in dense clusters under the right conditions. Arrowhead plants make a great addition to your mechanical filtration system. Their roots help filter nitrates and other excess nutrients from the water. As an added bonus, they also flower during summertime! While the little white flowers aren’t as spectacular as some of the other blooms on this list, they are still a great way to add some color and life to the above-water part of your pond. 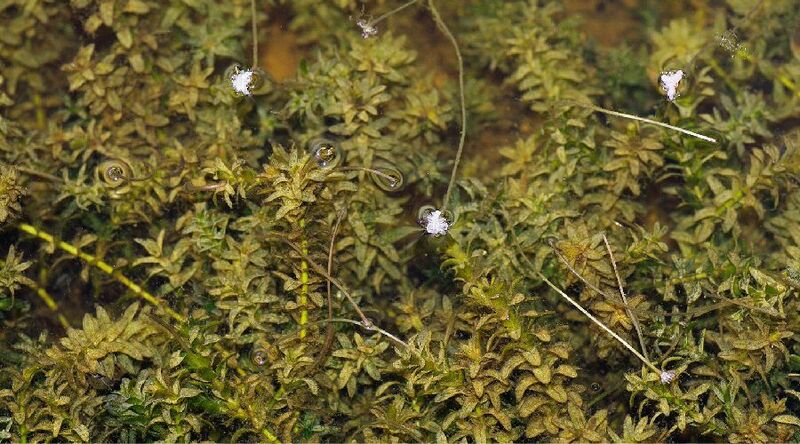 Bog plants a huge advantage to your pond ecosystem by aiding in the filtration process. Pitcher plants from the Sarracenia genus are our personal favorite bog plants because they don’t stop at just filtration – they are carnivorous plants that earn their space by your pond by trapping bugs in their trumpet-shaped leaves and dissolving them as a means of creating their own ‘fertilizer’. Say bye to those annoying wasps and flies! The most important thing to keep in mind when growing Pitcher plants is that they naturally occur in swamps that are very poor in nutrients. They make up for this with their bug-catching skills. This means that they have not evolved to survive in nutrient-rich environments and won’t do well when exposed to fertilizer or rich soils. Plant them in a mix of sphagnum moss and silica sand to prevent damaging their roots. Avoid pitcher plants if you use fertilizer for your other pond plants. Pitcher plants have adapted to growing in environments that get colder winters by developing a hibernation period. This makes them a great choice if you live in an area that tends to get chilly! We’ve already discussed a few lovely flowering plants that will really brighten up your pond. If you really want to go all out with the flowers, though, the beautiful blue iris is probably your best choice. This bog plant can be placed in pots in the margins of your pond (or grow freely if you don’t use pond liner). At the pond perimeter, it’ll help filter the water and provide refuge for all sorts of wildlife. You’ll see the striking blue-purple flowers appear around late spring/early summer. Note: Keep in mind that while some irises are aquatic, not all of them are. 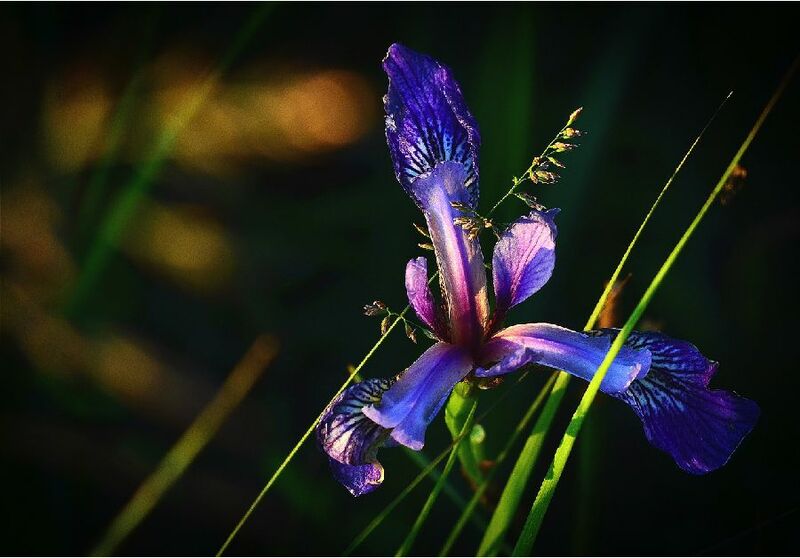 Only water irises like Iris versicolor will appreciate being grown as a pond plant – other types prefer dryer soil. 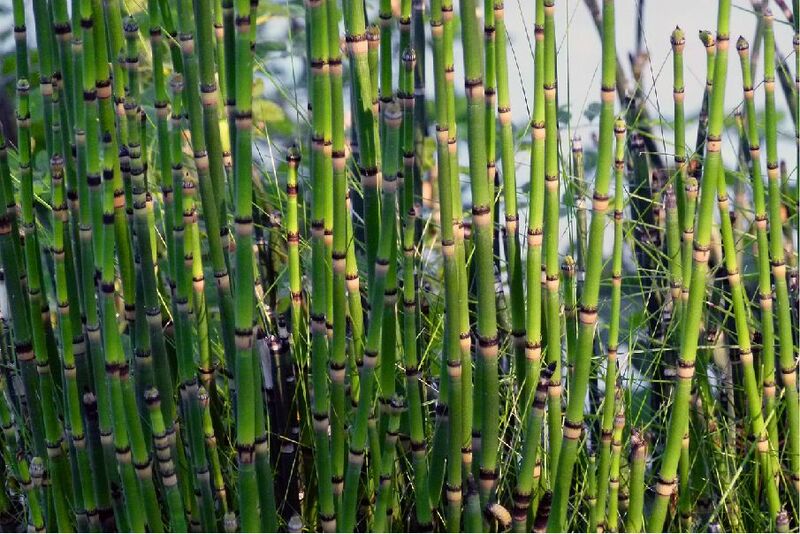 The bamboo-like horsetail is a popular pond plant due to its bamboo-like appearance, easy care, and quick growth. If you’re looking for a bog species that can withstand some cold (and will even stay green during the winter months), this is a great choice! This extremely ancient genus naturally grows in areas that get cold winters, so they definitely won’t mind frost. Keep in mind – horsetails can be vigorous growers, so if you’re worried about them taking over the entire margin of your pond, it’s probably a good idea to keep them confined to a pot. Although there are multiple plants in the Equisetum genus that are all referred to as ‘horsetail’, the most popular species is Equisetum hyemale. Cattails and their cigar-like flower spikes (catkins) are a very decorative addition to ponds, but can grow quite large. If your pond is a little too small to accommodate plants of this size, but you still want to enjoy the sight of those typical catkins swaying gently in the wind, don’t worry. There is also Typha minima, better known as the dwarf cattail. With a maximum size of around 18”, this plant has all the characteristics of the larger cattail varieties while still being perfect for smaller bodies of water, including tubs. 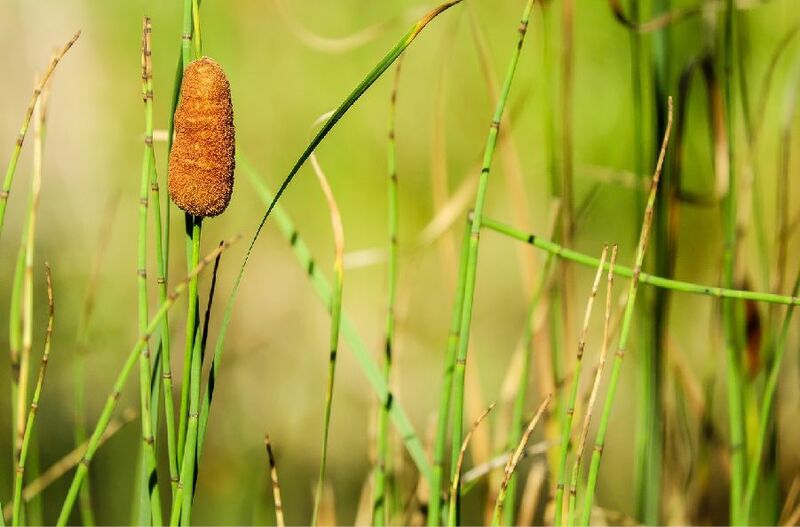 Dwarf cattails are relatively hardy and can be grown in USDA zones 3 and up. Do keep in mind that, like horsetail, cattail can spread quite quickly. Use a pot if you’re worried about the plant choking out other species. Important Note: many pond plants are considered invasive. In some states, certain species are even illegal to own. Before buying pond plants (especially online), be sure to check whether you’re actually allowed to grow them. Even if they are legal where you live, always be careful. Do not release aquatic plants into your native waterways and make sure to dispose of excess plants carefully. A well-planted pond is a joy to see, but invasive plants can damage or even completely destroy local ecosystems! One very important reason to add plants to your pond is because they can reduce the growth of common algae (like hair algae and floating algae). How? By lessening the presence of two of the most important components of algae growth: light and nutrients. Most plants (especially floaters) shade your pond from direct sunlight. Since algae typically thrives in high-light environments, reducing lighting levels can seriously curb algae growth. Additionally, both aquatic plants and algae need plenty of nutrients (such as phosphates and nitrates) to survive and grow. In a plantless pond, all nutrients are available to the algae. In a pond that has a ton of plants, algae has more competition and less available nutrients. As a result, algae growth will be reduced and the pond water can clear up quickly. 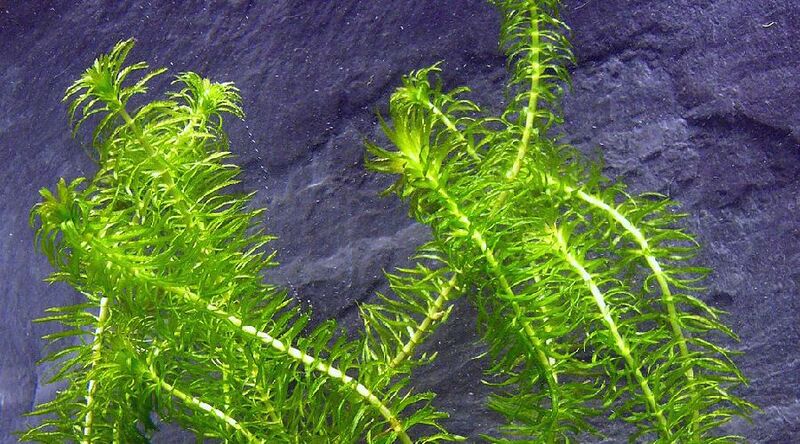 Vigorous growers like Anacharis and Hornwort are often referred to as oxygenating plants. During their growing season, these plants absorb a ton of CO2 and release O2 back into the water column. Now only does this help fish and other aquatic life, but it also helps reduce algae growth like we explained above. One of the most important arguments in favor of a planted pond is the advantage of added natural filtration. Plants filter harmful components like ammonia and nitrite from the water (and also help remove excess nitrates and phosphates that can cause algal blooms). In addition, their dense root systems make the perfect places for beneficial nitrifying bacteria to grow. Even if you can’t grow plants in the actual pond area, your pond can still benefit from these filtrating properties. If you’re worried that your fish will eat plants in the pond, just place them in your filter! Many pond owners reserve space for bog plants in their pond filters. Aquatic plants are the perfect way to add a natural look to your pond. This is beneficial to you as a pond owner, as the lush greens can really improve the look of your water garden and make your pond a wonderful place to sit by and relax. Additionally, your fish and other pond-related wildlife will also appreciate some vegetation. The cover helps them feel safe, reduces stress, and offers places for fry to hide and grow in peace. As we mentioned, pond plants can help shade your pond from direct sun. This doesn’t just come in handy for algae prevention; it can also be very helpful during the hot summer months when overheating is a real risk. Large leaves offer a shaded place for wildlife to cool off and help keep the overall temperature of your pond within a safe range. If you’ve ever dealt with natural predators choosing your pond as their hunting grounds, you’ll know how devastating it can be to lose stock. Herons, raccoons, cats and other animals will see an easily accessible pond as the perfect place to fish for a meal. While there are various systems that can help scare them away, there is also a natural method that can really help make your pond a no-fishing zone for opportunistic predators – plants! Place vegetation in the margins of your pond to make access a little more difficult and add floating plants like water hyacinth or water lettuce to offer fish and frogs a place to retreat to in case of danger. We’ve already mentioned this a few times, but we’ll say it again here: many fish love eating plants. Greens are a great natural addition to the diet of goldfish, koi and other herbivorous/omnivorous fish species. Once you’ve started up your initial plant population (in a separate tub, for example), it’s entirely free. In addition to larger organisms like fish appreciating the occasional green snack, plants also constitute an important food source for smaller pond inhabitants. Over time, submerged plant leaves and roots develop biofilm and become home to colonies of micro-organisms. These are the perfect diet for fish fry, insects, and tadpoles. When searching for the perfect pond plants, you’ll notice the possibilities are endless. That being said, not all of them will work well in your pond. 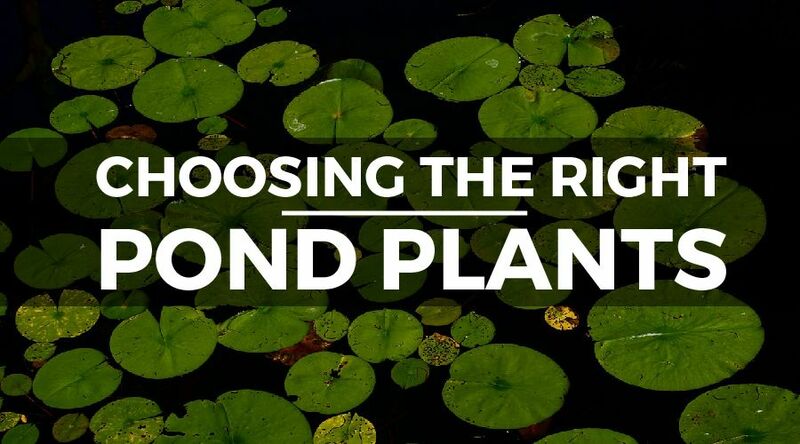 Whether a certain plant is the right choice for you depends on a wide range of factors like temperature, depth, water flow and your previous experience with growing aquatic plants. Your choice in pond plants is mainly limited by your local climate. If you live in an area that rarely, if ever, gets frost (like USDA zone 10) you’ll have more options than if things get extremely chilly during wintertime. Although many pond plants, like horsetail, pitcher plants and hornwort have evolved to deal with frost, many others prefer tropical temperatures and won’t return after dying off during winter. If you’re into gardening in general, you’ll know that plants have differing preferences when it comes to light. Some plants, like pitcher plants, will happily take as much sun as you can offer them. Others don’t respond to being in full sun quite as well. Always consider the location and sun level of your pond when choosing plants. Looking for a plant for the deepest part of your pond? You might want to skip the bog plants mentioned in this article (unless you’ve got floating containers, then they’re perfect). Alternatively, if you’re looking for a species to grow in the margins, then any of the submerged plants discussed here are better avoided. What we’re trying to say is: always consider the depth at which you’ll be growing plants. All have optimal locations in your pond and putting a plant in the wrong spot can lead to it dying off. Some plants naturally occur in rivers and streams, while others grow in entirely stagnant ponds or lakes. The former might not do so well if your pond has no water flow, while the latter likely will not appreciate strong filtration and the resulting increase in water movement. This means you’ll have to choose plants based on the amount of water flow in your pond to prevent problems. 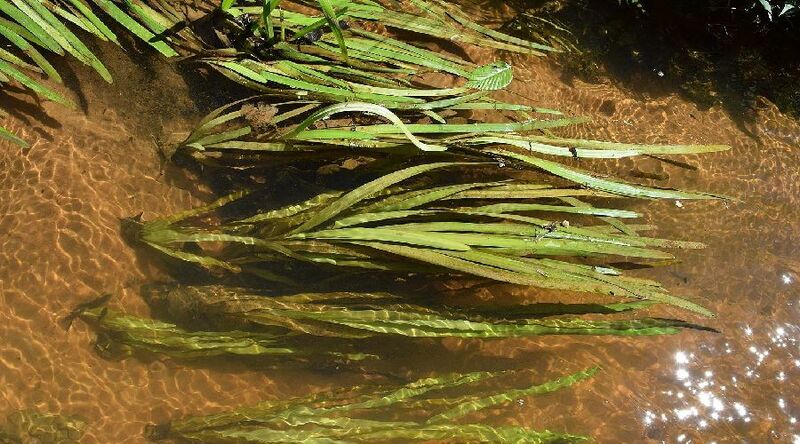 An example of a plant that won’t mind quite a bit of water movement is eelgrass. 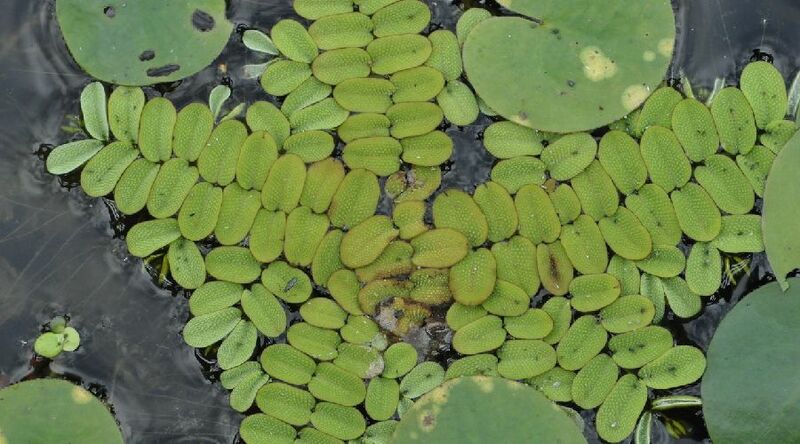 The relatively delicate floating Salvinia natans, on the other hand, is better avoided for turbulent waters. When choosing plants, always keep in mind your previous experience and the plant’s difficulty level. Some plants, like water hyacinth or horsetail, are so tough they’ll be able to survive any beginner mistakes. 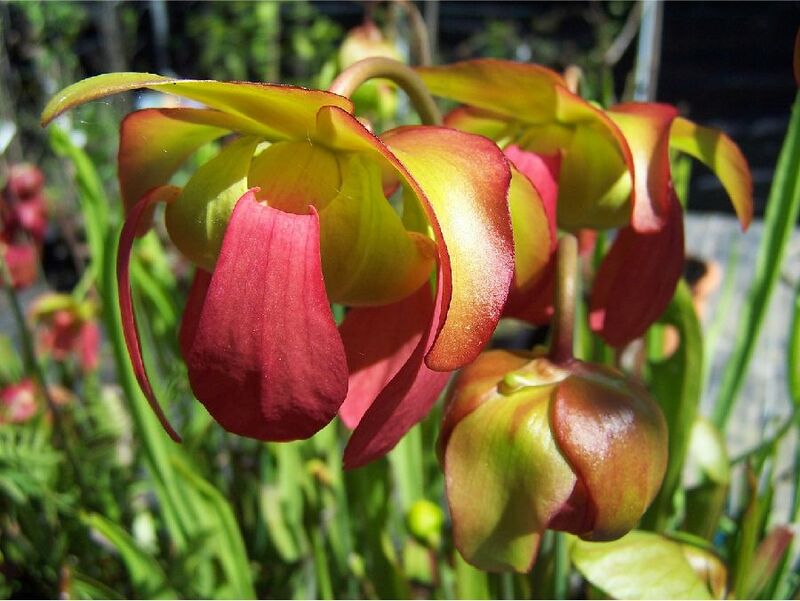 Others, such as pitcher plants, require a bit more specific knowledge for successful growing. Although you can grow more difficult plants as a beginner (with a bit of research and extra attention), you might not want to take the risk. Try sticking to easier plants at first if you’re just getting started or if you just don’t want to go through the hassle of providing special care. 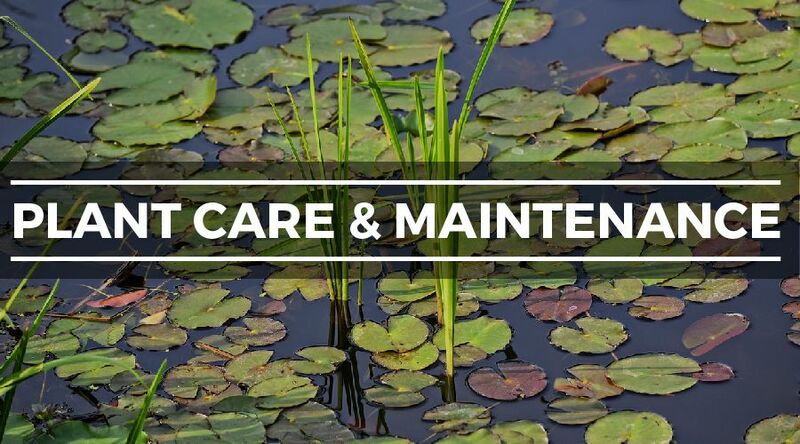 Like any garden, your pond scape will need a bit of maintenance to keep it looking its best. The amount of work you’ll have to put in varies depending on the amount of plants, plant species, and the season. 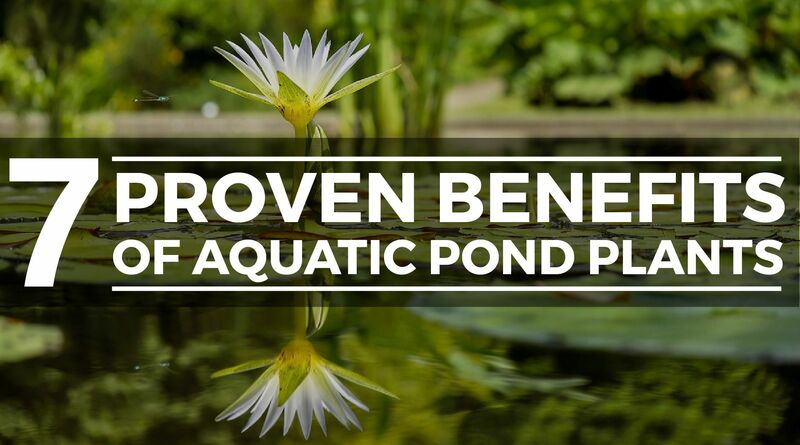 Whether your pond plants require additional fertilizer (and how much) during the summer months depends on factors like growth rate and the amount of fish you’ve got in your pond. If you feel like your plants would benefit from a bit of extra fuel, there are a few different types of pond plant fertilizer out there. All work well – just be sure to always avoid regular garden fertilizer, as this might be harmful to aquatic life! Even if you’re a fan of the lush jungle look, most pond plants will need to be pruned and/or thinned out sooner or later. Vigorous growers like water hyacinth might require you to remove excess rosettes almost daily, while pitcher plants might only require yearly pruning. The goal is to keep things balanced and looking decorative; once a species starts to crowd out others, it’s time to break out the pruning shears or pond net to keep things under control. Excessive plant growth can choke out other plants and even threaten animal life, so don’t wait too long. Winterizing your pond plants doesn’t have to be a lot of work, but it’s a good idea to still make some time for it every autumn. Stop fertilizing once temperatures drop. Remove dead leaves and place submersed plants on the bottom of the pond. Take a few rosettes of any floating plants indoors if you want to restart the colony without buying new ones next year. They’ll do fine in a vase on your windowsill until spring starts.